The following contains spoilers from Season One of Marvel’s The Punisher. Over a span of 10 minutes on the evening of October 1, a man named Stephen Paddock opened fire on concertgoers from the window of his Las Vegas hotel room. The shooting would claim 58 lives and wound hundreds more. Most of the country reacted in shock and sorrow. Some offered meaningless thoughts and prayers. Others called for stricter gun-control laws, to make it more difficult for men like Paddock to acquire arsenals capable of killing dozens of people in a handful of minutes. The executives of Marvel and Netflix reacted slightly differently: They worried about their new show, scheduled to release soon: The Punisher. Marvel and Netflix decided to cancel The Punisher’s New York Comic Con appearance and delay the release of the series. This was an understandable move, given that the story follows a man named Frank Castle (Jon Bernthal) who uses a gigantic arsenal of high-powered guns to kill criminals without remorse. Castle has always been a polarizing figure—his co-creator Gerry Conway describes him as a villain, not someone to look up to, but he didn’t count on the fans of the comics who saw in Castle their ideal hero. There are cops, soldiers and comics writers who see Frank Castle, a character so famous for killing people he is known as The Punisher, as a role model. Showrunner Steve Lightfoot had a delicate line to straddle when making this series: The Punisher had to be relentless enough to be true to the character, but repentant enough for people who don’t support incessant vigilante murder in place of justice. I had expected them to straddle this line by generally avoiding the conversation surrounding gun control, and by demonstrating that Frank’s methods are not the only way to achieve justice. And for the first half of The Punisher’s first season, that’s largely what I got: Different characters in the show pursue justice in different ways, and while guns certainly feature prominently, discussion of gun ownership is kept to a minimum. Over the first half-dozen episodes, the most we see is Frank showing approval for journalist Karen Page (Deborah Ann Woll) keeping a legal handgun in her purse, and disapproval for the arms dealer Turk Barrett (Rob Morgan) selling guns to drug dealers. Frank may see himself as above the law, but he supports responsible, legal gun owners, and doesn’t support illegal guns. Sure, okay. That’s a relatively uncontroversial depiction. It turns out there is exactly one character in Marvel’s The Punisher who advocates for tougher gun control. His name is Stan. Let me tell you about Stan. Senator Stan Ori is introduced late in the season, in the ninth episode (of 13). He’s a New York politician bent on expanding required background checks to buy guns. This is, in fact, the very first thing we learn about him: A radio host introduces him as a proponent of “tougher gun control laws.” Ori immediately comes off as not really knowing what he’s talking about—portrayed with a slick vagueness by Rick Holmes, he briefly debates gun control with Karen Page and the radio host before they are interrupted by domestic terrorist Lewis Wilson (Daniel Webber), and Ori never makes a point that isn’t quickly rebuffed by either the radio host or Page. This ends up being the defining dynamic of Ori’s character. The senator only appears in the ninth and tenth episodes of The Punisher, but by the end of his tenure, the character and his actions have thoroughly discredited his views on guns. Every time Senator Ori makes a point about gun control, the show itself not-so-subtly displays that it thinks he’s a coward and a hypocrite. The first thing Ori does after getting menaced by Wilson is hire private security. Every main character in the show condescends to him about this fact. You’re against guns, yet you employ armed security? His head of security, Billy Russo (Ben Barnes) condescendingly tells the senator that his presence is what will allow Ori to continue having his debates. When Ori tells Karen Page that society should give her the “personal safety” she bought her handgun to provide, she glances at the armed guards at the door. Somehow, the scene manages to make investigative journalist Karen Page remind us of Donald Trump referring to Hillary Clinton’s armed security: “Take their guns away, let’s see what happens to her.” The show practically smirks as it tells you what a hypocrite Ori is for wanting to take guns away while hiring security for himself after a terrorist threatens his life. Wilson makes an attempt on Ori’s life in the tenth episode, which is called “Virtue of the Vicious.” Ori acquits himself like a coward in the attack, whimpering as he crawls on the floor, looking for an escape. He only survives the encounter because of Castle’s heroic efforts, and because he throws Karen Page under a bus and lets Wilson have her instead of him. On top of all this, he then lies to the authorities about the incident, saying he bravely shot at Wilson before running to get help. With that, Ori exits the show. He is not seen again. Senator Stan Ori, the only character in the entire show to advocate for tougher gun control, is a craven buffoon whose cowardice is only matched by his hypocrisy. He is a laughably obvious straw man who may as well have been thought up by the NRA: He couldn’t fit the caricature of the hated Democrat politician any better. What’s interesting here is I doubt The Punisher is doing this intentionally—this stinks less of a deliberate stand against tougher gun control and more of a witless attempt to make Castle seem magnanimous for saving Ori. Don’t worry, Senator, you’re foolish and cowardly for wanting to make it harder for people to purchase killing machines, but Frank Castle will save you anyway. Ori is more of a throwaway gag than a fully-formed character or an earnest political stance: Wasn’t it funny that that moron who wanted tougher gun laws was saved by a man with a gun? Anyway, back to The Punisher, who is a hero. 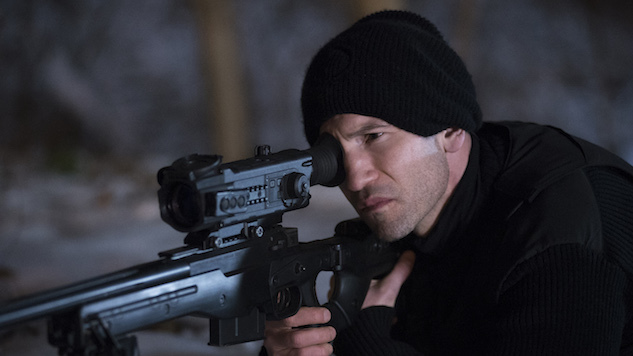 With Ori and his views out of the picture, The Punisher can focus on what is evidently the primary goal of the season’s second half: to paint Frank Castle—the damaged, murderous vigilante whose main “superpower” is the willingness to use high-powered rifles without remorse—as a hero. Ori, like every other character in the second half of the season, is a pawn the writers use to illustrate how much they admire Castle. By the time Ori appears, there has already been a noticeable tonal shift in The Punisher, starting somewhere around the seventh episode. Where the first half of the season portrays Castle as morally ambiguous, the second half begins to praise and reward him, even for outright immoral behavior. In the eighth episode, Castle menaces a child, pressing a combat knife against the young boy’s throat. The series portrays this as tough love, a necessary bonding moment. The two are happily playing catch a minute later. Ori’s moral arc in the tenth episode is part and parcel of Frank Castle’s lionization. Between the cowardly senator and the deranged bomber, Lightfoot and co. frame Frank Castle, The Punisher, as the sensible middle ground in this debate. Ori is a weak-hearted liberal and Wilson is a murderous Second Amendment zealot, The Punisher seems to be trying to say. Good thing ol’ Frank is here to sort those two out. Why Lightfoot decides to take on the gun control debate in this derisive, callous manner, I’ll never understand. But I know that audiences won’t buy Frank Castle as some kind of moderate on the issue of guns—all they need to do is look at his vast arsenal of weaponry for that. Of course, The Punisher won’t let that stop it from making Castle out to be some kind of understanding hero, and the series even doubles down by having Castle say completely out-of-character sound bites. Castle says he hates bombs at one point, but he consistently uses hand grenades and other explosives; he also says to Wilson that he looks the men he kills in the eye, but there are many instances of him killing people in the dark before they ever lay eyes on him. None of these logical inconsistencies matter to The Punisher. At some point in the first season, all hope for nuance flies out the window, as the series suddenly spends all its time telling you about how Frank Castle is a good, special man, justified in his actions. And if Castle is right all the time, people who disagree with him have to be wrong. Frank Castle is a hero, and he uses guns. I doubt the writers of The Punisher sincerely believe that tougher gun control is for cowards, but that’s still the message they’ve unwittingly sent: Stan Ori is a coward, and he believes in stricter gun control. If you’re not a coward, you must agree with The Punisher, the hero who uses high-powered rifles to kill dozens of people in a handful of minutes. Eric McAdams is an editorial intern for Paste and a podcaster in his spare time. You can see his bad tweets @EdaciouslyYours and you can hear his podcasts on the Major Casts Network.